Nests underground and in cavities in tress and buildings. 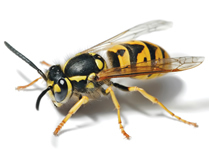 Nests can be located by searching likely sites on fine days for signs of wasp activity. Flight lines of foraging wasps converging towards, or diverging away from nests may be observed in order to pin-point the nests. Powder treatment: an insecticidal powder can be applied around and into the entrance of the nest. Workers are contaminated when they return to the nest and carry the powder inside. Surface spraying: liquid surface spray may be applied liberally and directly to the nest or to the entrance holes of concealed nest. Smokes: An insecticidal smoke can be released in the cavity occupied by the nest. Workers are 3.4-5mm long, queens 15mm long. Workers are dark brown-black, queens mid-brown; waist of only one segment. An active insect, it nests outside in grass and walls and under paving. It will forage widely in search of food, which is how it comes to enter domestic premises. Insecticide treatments can be applied in and around the nest and should aim to ensure that a residual film of insecticide is maintained at strategic points, for example points of entry to buildings, such as doors, windows, ventilators, ducts & drains. Insecticidal baits, too, can be used around the entry points. Adults, 2-3.25mm long. Adult fleas live exclusively as parasites of warm-blooded animals, especially mammals, although birds may also be attacked. 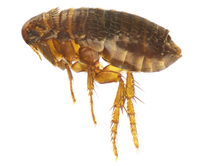 Whilst they show a certain degree of host preference, fleas are by no means specific and will feed on other animals in the absence of the normal host. Insecticides can be used to treat infested premises and protect them from reinfestation. In addition, hosts can be treated directly. The most common species in Northern Europe are Oriental (Blatta oreintalis) & German (Blattella germanica). Adults, 20-24mm long. Cockroaches are common in commercial premises associated with production or handling of food. Also in public buildings and domestic premises e.g. apartment blocks. The germanica generally prefers warmer, humid environments, e.g. centrally heated buildings, whilst the orientalis is frequently encountered in cooler, less humid areas such as basements and drains. Surface sprays: Effective treatment depends upon the selection and thorough application of a suitable insecticide. Many insects and egg cases are well hidden. To control an infestation the insecticide should ideally persist until all egg cases have hatched but continued immigration may demand routine treatments. Space sprays: Regular treatments are necessary e.g. at weekly intervals until infestation is brought under control. Thereafter, maintenance treatments, at less frequent intervals, should keep insect population at an acceptable level. Insecticidal baits: Baits offer the opportunity for controlled placement of insecticides formulated in attractive food bases. 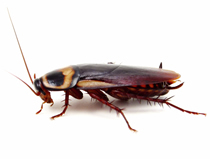 Baits offer the opportunity for continuous control of cockroaches over extended periods.